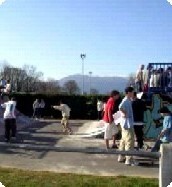 Other activities around the Fontaines d’Escot. The game consists in eliminating the opponents with a gun that shoots balls of paint. The objective is to capture the flag. During summer a tournament is organised every Thursday. All equipment is provided. A large 1,000m² area with 85m of bitumen skatable tracks. There 10 different features: pyramides, bank transfers, quarter plan inclines etc. Travelling through trees at the foot of the Pyrenean mountains is a fabulous nature activity for the whole family! The «Course Acrobatique Forestier», in the Aspe Valley, runs at the heart of natural forests with 4 per courses for different levels. 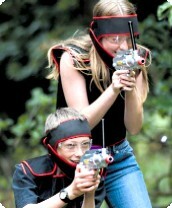 The Adventure Park at Aramitis is also a challenge with 110 different jungle games among 10 courses of various difficulty. 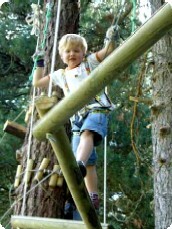 From yellow courses for small children to the black courses that climb up to 20m above the ground. 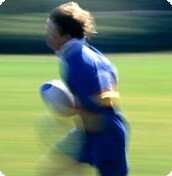 Rugby supplants football as the favoured spectator sport of the Pyrenees. Every town and village has its own local team. A lot of French international players come from these parts. Gymnasium: A large area for collective sports with a «dojo» and an apparatus room for sportive gymnastic.